Joey Tuan had just graduated from UC Berkeley’s undergraduate business school and was working as a consultant in San Francisco. During a 17-mile hike at Yosemite, he got full-blown flu symptoms, except they didn’t go away. Doctors were baffled, so they diagnosed him with Myalgic Encephalomyelitis, then POTS, then Lyme Disease. He spent 5 years jumping from one patient forum to another and $200k trying different treatments, and he lamented that there wasn’t a one-stop shop for the millions with multiple diagnoses. Ultimately it was only the sheer luck of hearing about a treatment from another patient that led to improvement. With his improved health, he set two goals: help chronically-ill patients share treatment experiences in one centralized place, and turn all these patients’ experiences into research studies. 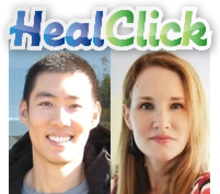 Joey and cofounders Cari Allshouse and Beth Mazur turned this vision into HealClick, a website that uses patient-matching to make sense of all the treatment reviews shared online. First, patients use our tracking system to share basic biographical info, conditions, symptom ratings, and treatment ratings. Then we match them up by how much they have in common! (Read more about Patient-Matching) Now they can see treatment reviews from their best patient matches. All this data will be used for medical research after we make it anonymous.